New handy camera DC923 with Face Detection technology available now. Releasing the new DSL500/ DSL510 series of ADSL2 and ADSL2+ modem with integrated router. 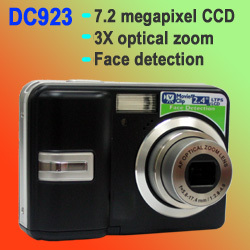 New camera DC830 features 7.2 mega CCD, large 3-inch TFT, 3X optical zoom and slim body. Meets the slim and versatile DC825 camera. Featuring 6.2 mega CCD, 2.5-inch TFT, 3X optical zoom, movie, voice recorder, MP3 player and games. Introducing the new MR110 Video Recorder that supports SD card, in addition to MS and CF card. More.. Handy point-and-shoot camera with new features of Face Detection technology and Image Stabilizing helper. Meets the demands of new generation of DC with its 7.2 megapixel CCD, large 3-inch TFT, 3X optical zoom, sleek body, built-in MP3 player and more. Records video in MPEG-4 format onto Memory Stick/SD/CF card. Optimized for playback directly on PSP™ or transfer the video to iPod™ via iTunes. With a SD/CF card slot for other players, Smartphones and PDAs. More..
From 7 megapixel CCD full-featured models to value models with 2 megapixel. Many choices of model that is ideal for premium and gift. Latest models of ADSL2+ / ADSL2 modem with integrated router.